Zurich, Switzerland, 1st August 2018 - Datacolor, a global leader in color management solutions, has today launched an extensive color management eBook for photographers and videographers. ‘Spyder5 eBook: Color management can be easy’ is a six-chapter guide providing practical advice to help any photographer or videographer understand color management, from the basics to the advanced. Chapters will be published in three-week intervals and sent to readers once they have registered online. Those who download the eBook will also receive 20% off the Spyder5Pro and Spyder5Elite. The first chapter is now available for download from the Datacolor website here. "We repeatedly found that even after more than 20 years of digital photography, color management is regarded as a difficult and complex topic and is therefore often neglected. Users often have difficulties with achieving accurate color reproduction and maintaining the brightness of their images in photo books or prints," says Stefan Zrenner, Global Director of Sales and Marketing Consumer Products at Datacolor. "With our free eBook, we want to make our color management know-how accessible to everyone and show that this topic is not complicated at all." The eBook explores the basics of color management, calibrated photography, and the steps needed to reproduce accurate colors on the monitor, when printing at home and through print service providers. The first chapter will walk you through which color measuring instruments you need for color management, and why you should work with RAW data. Chapter Two is a guide to the first step in the color workflow – camera calibration. The chapter focuses on the tools available for calibration, obtaining evenly-balanced contrast with the SpyderCUBE, achieving color balance with the SpyderCHECKR, and razor-sharp autofocus using SpyderLENSCAL. Discover how to initially calibrate your monitor and find out what a colorimeter can do for you during this process. Chapter three will also teach you how to control ambient light and demonstrate the options a soft proofing tool can offer. Chapter Four delves deeper into monitor calibration, with a focus on making extended calibration settings, and an explanation of what an advanced analysis entails. Learn how to calibrate two monitors, and find out what different elements you need to pay attention to when calibrating a complete studio and a projector. The penultimate chapter teaches you all you need to know about printer profiles, and explains how to check if your printer and printer driver are working properly. Find out what you need to be aware of when working with a Spectrocolorimeter and discover Datacolor’s measuring technology. The final chapter deals with your questions on the final stage of your workflow – exploring how to proof your images on your monitor, and what to consider when printing your photos by yourself, on paper, canvas, and foil. The chapter will also tell you all you need to know about monitor proofing during photo printing from a service provider. Each chapter also contains a detailed glossary of color management terms. The first chapter of the eBook is now available for download from the Datacolor website here. Lawrenceville, NJ – Datacolor, a global leader in color management solutions, today announced the release of Spyder5+, the next generation software expertly designed to build upon its popular color calibration tools for photographers, designers, videographers and imaging professionals. New and existing Spyder5 customers wishing to purchase the Spyder5+ software add-on can find out more and buy via the Datacolor website. Upon software purchase, customers will receive a software serial number and a step-by-step guide for easy download. 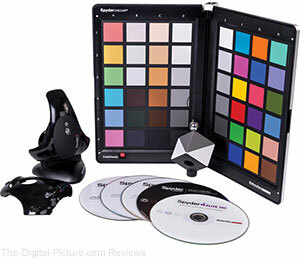 B&H carries Datacolor Spyder5 Display Calibration products. Lawrenceville, NJ – August 16, 2016 – Datacolor, a global leader in color management solutions, today announced the release of Spyder5CAPTURE PRO, the next generation of its popular color calibration solutions for photographers, designers and imaging professionals. Spyder5CAPTURE PRO features all the essential products needed to manage color from image capture to post production, including SpyderLENSCAL, SpyderCHECKR, SpyderCUBE, and Spyder5ELITE. SpyderLENSCAL allows users to calibrate camera and lens combinations, resulting in accurate auto-focus. SpyderCHECKR and SpyderCUBE provide the user with reference tools to allow control of contrast, white balance and color when editing images. Spyder5ELITE calibrates displays to an industry standard, ensuring that on-screen colors of images are accurate and match photo prints every time. The new Spyder5CAPTURE PRO offers a bundled product savings of over 30 percent. For a limited time, Datacolor and participating photography resellers are offering Spyder5CAPTURE PRO at an introductory price of $269.99 if purchased by 9/30/2016. After 9/30/2016, Spyder5CAPTURE PRO will retail for $369.99. B&H carries Datacolor Spyder5CAPTURE PRO. Lawrenceville, NJ – September 10, 2015 – Datacolor, a global leader in color management solutions, today announced the release of Spyder5STUDIO, the next generation of its popular color calibration solution suite designed to color manage digital photo workflows. 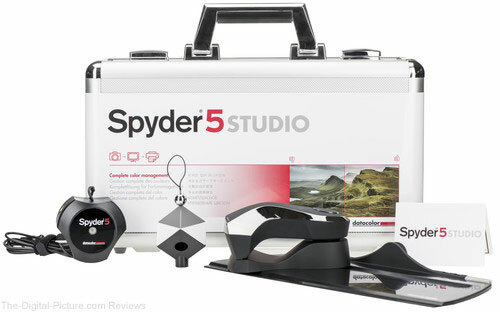 Spyder5STUDIO features a collection of tools that ensure photos are captured accurately, monitors display true-to-life colors, and prints are matched precisely. Datacolor Spyder5STUDIO is designed for photographers who demand the highest level of control and accuracy. It includes the new Spyder5ELITE colorimeter, the color calibration solution that adjusts monitors to an industry color reference standard so colors are accurate and shadow and highlight details are preserved, ensuring on-screen images match photo prints. An important tool for all photographers, Spyder5ELITE assures true screen color, reducing editing time and providing better print matching so less ink and paper are wasted. In addition to its display calibration solution, Spyder5STUDIO includes camera and print solutions: The SpyderCUBE, is a portable device for photographers to set white balance, exposure, black level and highlight references based on lighting conditions when shooting images. SpyderPRINT is a full-featured spectrocolorimeter used to create custom RGB printer profiles, for all of your ink and paper combinations, to provide the most accurate screen-to-print matching. Combined, these tools enable photographers to capture consistent color from scene to camera and monitor-to-monitor, as well as quality printing results, enhancing the entire photo workflow. The new Spyder5STUDIO is now available for $499.99 USD (offering a bundled savings of $180!) at photography and consumer electronics retailers nationwide. B&H has the Datacolor Spyder5STUDIO Color Calibration Bundle available for preorder. Lawrenceville, NJ – April 7, 2015 – Datacolor, a global leader in color management solutions, today released Spyder5, the next generation of its popular monitor calibration solutions. Datacolor Spyder5 is the color accuracy solution designed by photographers for photographers, to help them see, share and print their images, just as they intended. The 3 versions of Spyder5 – EXPRESS, PRO and ELITE – reduce the hassle of figuring out why digital photographs look different on screen, and why the colors on screen don’t match photo prints. All Spyder5 product versions adjust, or calibrate, monitors to an industry color reference standard so colors are accurate and shadow and highlight details are preserved. With true screen color, photographers can more accurately edit their photos and achieve better print matching. The next generation Spyder5 colorimeter is compact, portable and protected for use on all laptop and desktop monitors. Datacolor has redesigned Spyder’s patented 7-detector optical engine to deliver up to a 55% improvement in tonal response, resulting in more accurate shadow detail and smoother gradients. Spyder5EXPRESS is a cost-effective tool for serious photographers seeking an easy-to-use color accuracy solution through a simple, interactive four-step process guide. Using it’s before and after feature, users can evaluate calibration results using a professional Datacolor composite image. Spyder5EXPRESS also supports multiple monitor calibrations. Spyder5ELITE offers professional photographers, studios, and calibration perfectionists who demand the highest levels of color accuracy, ultimate control of the calibration process. Spyder5ELITE offers a built-in tripod mount to easily calibrate front projector displays. Expert features include an unlimited range of calibration settings, comprehensive display analysis, advanced before and after evaluation of imported images, monitor matching and tuning, and optimized gray balance routines. The new Spyder5EXPRESS, Spyder5PRO and Spyder5ELITE are now available at photography and consumer electronics retailers nationwide or online at datacolor.com/spyder5-pr. The Spyder5EXPRESS is priced at $129, Spyder5PRO at $189, and Spyder5ELITE at $279. B&H carries the Datacolor Spyder5 line of color calibration tools. 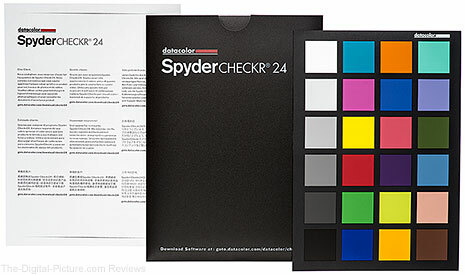 Lawrenceville, NJ – August 5, 2014 – Datacolor, a global leader in color management solutions, today announced Spydercheckr 24, a new addition to the Spydercheckr product line, which includes the flagship 48 patch Spydercheckr. Spydercheckr 24 is a precise and versatile camera color calibration and white balance target for photo and video color control for on-the-go professional photographers and videographers. Portable and affordable, Spydercheckr 24 is designed to color manage camera and scene for both still and motion imaging workflows. Spectrally engineered with 24 pigment patches, Spydercheckr 24 offers the accuracy of a full size, large patch photo target in a thin, compact design. Spydercheckr 24’s gray face provides in-camera and post-process white balance and exposure adjustment, while the color face allows users to color correct capture automatically in Adobe Photoshop ACR, Adobe Lightroom, Hasselblad Phocus, and Blackmagic DaVinci Resolve. The Spydercheckr 24 is available immediately for $49.00 USD at photo and video retailers. B&H has the Datacolor Spydercheckr 24 available for preorder. Lawrenceville, NJ – May 6, 2014 –– Datacolor, a global leader in color management solutions, today announced its Great Alaskan Photo Expedition Sweepstakes. The online promotion, beginning today through May 27, 2014, will award one lucky winner an all-expense-paid trip to Cook Inlet, Alaska to spend one week photographing the region’s most remarkable wildlife alongside award-winning nature photographer David Cardinal. To enter to win, visit datacolor.com/safari-sweepstakes-pr. The grand prize, valued at an estimated $10,000, will include round-trip airfare to and from Anchorage, departing from the winner’s originating city July 8, 2014 and returning July 16, 2014; all meals and lodging, including a 5-night stay at Silver Salmon Creek Lodge; private charter flights to and from Lake Clark National Park and Preserve; one-on-one photo instruction both in the field and in a classroom setting; and a Datacolor SpyderCAPTURE PRO. Sponsored by Sigma, Datacolor’s Great Alaskan Photo Expedition Sweepstakes will also award the winner a 150-500mm F5-6.3 APO DG OS HSM telephoto lens to be used while on the safari and long after. Second and Third prizes will include a SpyderCAPTURE PRO and SpyderCHECKR PRO. Guided by professional photographer David Cardinal, who will be returning to Cook Inlet for his 15th year, the winner, along with an intimate group of photographers, will spend a week shooting some of the best scenery Alaska has to offer including coastal brown bears, or “grizzlies,” tufted and horned puffins, brilliant sunrises, and breathtaking landscapes. Lawrenceville, NJ – April 7, 2014 – Datacolor, a global leader in color management solutions, today announced SpyderHD, the premiere color calibration suite for advanced and professional photographers and videographers. SpyderHD is designed to color manage photo and video workflows, from scene, camera and editing, to final output. SpyderHD includes the new Spyder4ELITE HD integrated display calibration application; the first of its kind, with calibration functions for computer displays, video reference displays, and TVs, all within a single application. SpyderHD also includes the innovative SpyderWEB, a universal mounting system that securely mounts the Spyder for calibration of most screens up to 70”. “As a photographer who has been calibrating for a long time, I understand the value of color calibration. SpyderHD is my preferred solution for tonal linearity in computer display calibration, and beats my personal calibration technique for video reference display calibration,” says Lee Varis, renowned Hollywood photographer. In addition to display calibration offerings, SpyderHD includes two important camera solutions: the SpyderCHECKR, a powerful color reference and gray card system, and the portable SpyderCUBE, which provides white balance, exposure, black level and highlight references in any lighting condition. Combined, these tools enable photographers and videographers to capture consistent color day-to-day and camera-to-camera, enhancing their entire digital workflow. SpyderHD is available immediately for $349.00 USD at photo and video retailers. For more information, visit www.datacolor.com/spyder-hd-pr. B&H carries the new Datacolor SpyderHD Color Calibration Bundle. Lawrenceville, NJ – March 27, 2014 –– Datacolor, a global leader in color management solutions, today announced its Spring 2014 line-up of free color management webinars. The webinars will cover important topics in the photo and video industry with the help of notable sponsors including, Plura Broadcast, Macphun Software, X-Shot, Wacom, PhotoshopCAFE and Hunt’s Photo & Video. The webinars will include an interactive question and answer format, allowing participants to communicate directly with the speakers to get first-hand advice about video reference display calibration and photo and video editing techniques. Registered attendees will receive discount codes for Spyder products and/or products from co-sponsors, as well as automatic entry for a chance to win products from Datacolor Spyder or co-sponsors. Each webinar will be hosted by David Saffir, Datacolor expert and noted landscape and fine art photographer. Lawrenceville, NJ – November 25, 2013 – Datacolor, a global leader in color management solutions, today announced it will be hosting a month long holiday giveaway during the month of December. Beginning December 1, daily prizes will be awarded through the Datacolor website with a new door opening each day to reveal the featured prize and partner. Professional and novice photographers, videographers and graphic designers alike are encouraged to enter the Datacolor Happy Holidays Giveaway for a daily chance to win essential tools to enhance their digital workflow.. The Datacolor Happy Holidays Giveaway will include prizes from the award-winning Datacolor Spyder line such as Spyder4ELITE and SpyderCAPTURE PRO, as well as products from partnering brands like DxO Labs, Fujifilm, Gura Gear, Lowepro, MyPix2, SanDisk, Tamron, Wacom, Zenfolio, and many more. A full list of partners can be found at spyder.datacolor.com/holidaygiveaway-friends. Winners of the Datacolor Happy Holidays Giveaway will be chosen at random and announced daily on the Datacolor website. Lawrenceville, NJ - July 29, 2013 - Datacolor, a global leader in color management solutions, announced today its summer 2013 line-up of free color management webinars. The popular webinar series continues with new co-sponsors and a variety of introductory and advanced webinars to demonstrate new techniques for photographers and videographers to enhance their skills. Datacolor is bringing dynamic topics with the help of notable photography related companies including Sigma, Hoodman, onOne Software and Eizo. The webinars, hosted by David Tobie, global product technology manager for Datacolor, and David Saffir, Datacolor expert and noted landscape and fine art photographer, focus on managing color using tools in both capture and processing stages. Each webinar includes step-by-step demonstrations using Datacolor’s line of Spyder color calibration devices, and in-depth discussions on how photographers can effectively use the right tools and techniques to produce high quality results with their own images. Those interested in attending can register in advance for the free webinars. Attendees will be given discount codes for Spyder products and/or products from co-sponsors and automatically be entered to win a Datacolor Spyder product and products from co-sponsors. Guests will have the ability to interact with the speakers in a Q&A format, and get first-hand input about applying color management effectively within their workflow. Register now at Sigma 18-250mm f/3.5-6.3 DC Macro OS HSM Lens. For anyone who views images via tablets or smartphones – and for on-the-go photographers in particular – they should think about color calibration. Tablet and phone displays are amazing, but are they always accurate? The Android version joins the previously available iOS SpyderGALLERY app. Using a Spyder4 calibration device, Android users can now enjoy color-managed image viewing in the SpyderGALLERY app, which accesses existing photo albums to display accurately calibrated, vibrant images. Viewing images through the color-managed viewer will allow for more accurate color and provide users with a closer match to desktop monitors and other color-managed displays. You can get the SpyderGALLERY app for Android in the Google Play store. The iOS application is available in the Apple Store. 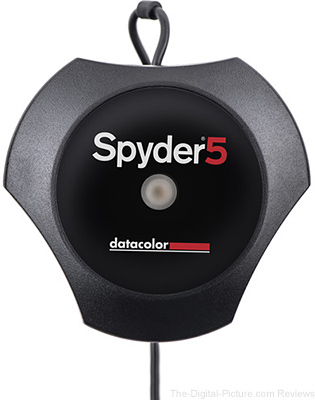 Adorama carries the Datacolor Spyder4 Colorimeters. Flowers are a favorite subject matter for photographers. Composition, methods, equipment, and settings will all be touched upon, with an inspiring series of floral images to demonstrate each tip. Using the correct lense is crucial to ensure that you will capture your best possible shot. When choosing, Lensbaby lenses are a natural for soft-focus, controlled-focus and macro shots. Join us, Wednesday, February 27th from 3PM-4PM EST, as Datacolor Experts David Saffir and C. David Tobie explore a wide range of tips and techniques that can help you move your floral photography to the next level. An interactive Q&A will take place throughout the webinar to answer any questions you may have. One lucky webinar guest will win a free SpyderLENSCAL! Lawrenceville, NJ – January 28, 2013 – Datacolor® (www.datacolor.com), a global leader in color management solutions, announced today its winter 2013 line-up of free color management webinars. Continuing its popular series, Datacolor is offering introductory and advanced webinars on a variety of topics to demonstrate new techniques for photographers to enhance their skills. Additionally, Datacolor is partnering with other notable photography related companies for an even more dynamic webinar series. Co-sponsors, including Lensbaby and SLR Lounge, will offer product giveaways and promotions. The bi-monthly webinars, hosted by David Tobie, global product technology manager for Datacolor, and David Saffir, Datacolor expert, noted landscape and fine art photographer, and author of “Master Digital Color,” focus on managing color using tools in both capture and processing stages. Webinars include step-by-step demonstrations using Datacolor’s line of Spyder color calibration devices, and in-depth discussion to provide photographers with new methods to produce high quality results with their own images. March 28, 2013 3:00 - 4:00 p.m. EST: What’s in Your Camera Bag? Those interested in attending can register in advance for the free webinars. Attendees will be automatically entered to win a Datacolor Spyder product coinciding with the webinar topic. Guests will also have the ability to interact with the speakers in a Q&A format, and get first-hand input on applying color management effectively in their workflow.